Mark Zuckerberg wants you to know that he’s not just the guy running a social network that knows way too much about you and has an unbridled misinformation problem. He’s also a guy with a life outside of the machine! Since 2009, Zuckerberg has set out “to learn something new” each year. And today he announced his personal challenge for 2018: better policing his platform. Making sure Facebook is a more enjoyable, safe, and trustworthy platform is a great goal. Though, and just hear me out here, it’s almost as if this should have been a goal since it was founded in 2004. 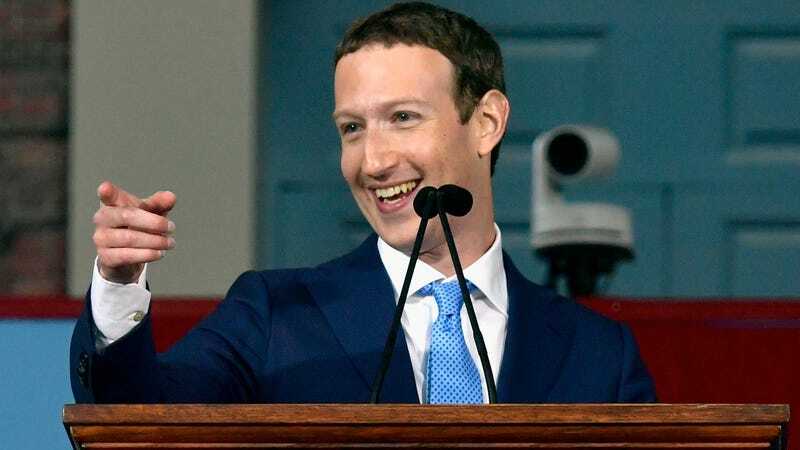 In the past, Zuckerberg’s challenges have included tasks like touring our great country, reading a bunch of books, running a bunch of miles, and learning a new language. It’s hard not to see the humor in his personal goal sounding a lot like his job description. The Facebook CEO announcing his personal challenge is to better moderate his platform is like a blogger proclaiming their personal challenge is to write words and publish them on the internet. “This will be a serious year of self-improvement and I’m looking forward to learning from working to fix our issues together,” Zuckerberg wrote in today’s Facebook post. If this is the year of self-improvement, last year was surely the year of the shitstorm. Facebook struggled to deal with foreign election interference on its platform, an issue that brought the tech giant before Congress in October. It also struggled to handle fake news on its platform, eventually hiring third-party fact-checkers who themselves were skeptical of Facebook’s efforts. The social network also came under fire after reports that it let advertisers exclude users based on race and ethnic groups. It also helped companies only target certain age groups. So for those who believed 2018 would be better than its hellish predecessor, you can at least look forward to one improvement: Mark doing his job.